Water is the most hydrating fluid one can have. We need sufficient water for our body to perform basic functions like regulating body temperature, for functioning of kidneys, transportation of nutrients, digestion and much more. 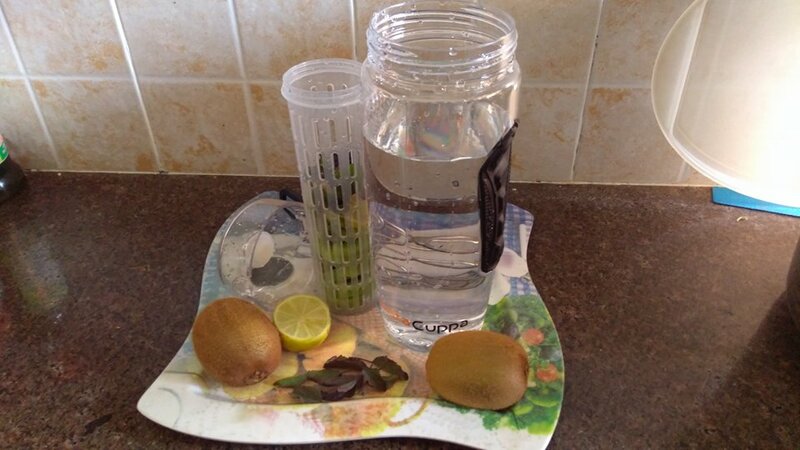 We simply need to drink plenty of water to keep our inside system htdrated enough to work seamlessly. I suspect many of us don't drink enough water. And if you're unsure of whether your body lack water, notice symptoms in your body like fatigue, reduced urination, bad breath, dry mouth, poor concentration, headache and so on. These are direct warning signs that indicate your low water intake. I myself had not been extremely careful in drinking water in desired quantity, but it has caused me issues like dry skin, muscle pain, lethargy in the past. I kept on excusing myself for drinking less water considering my continuous lectures at my work place. 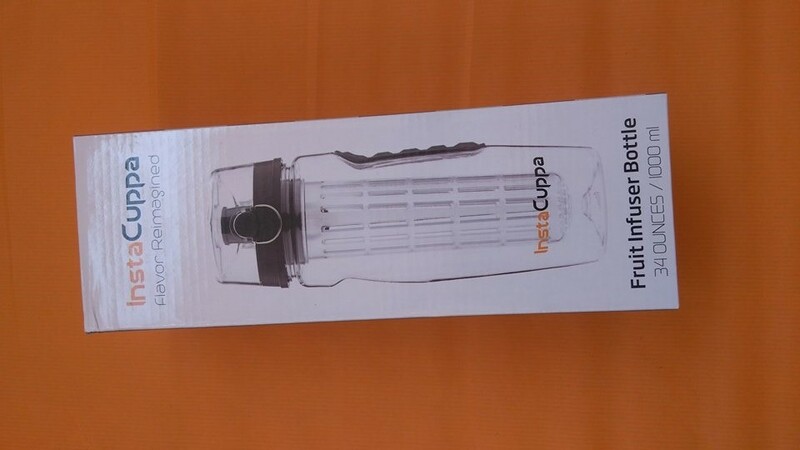 Anyways, taking a lesson from the present situation, I've started carrying flavoured water in my InstaCuppa Fruit Infuser bottle. 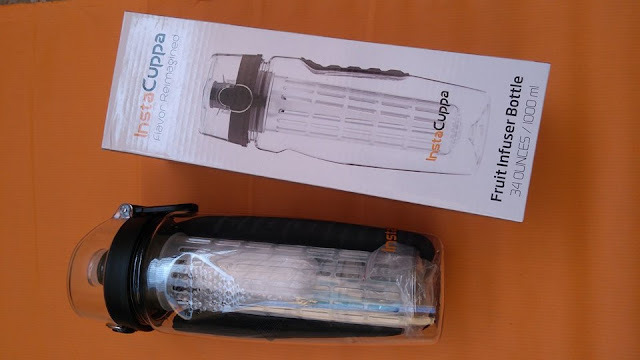 InstaCuppa Fruit Infuser is a good-looking transparent pitcher made of Tritan which isBPA-free plastic and an assurance of good quality. The infuser tube that is inserted in the middle of the pitcher is large enough to reach almost the full length of the pitcher providing tasteful flavours till the last sip you take. Here goes an extra 'plus' for gym freaks. 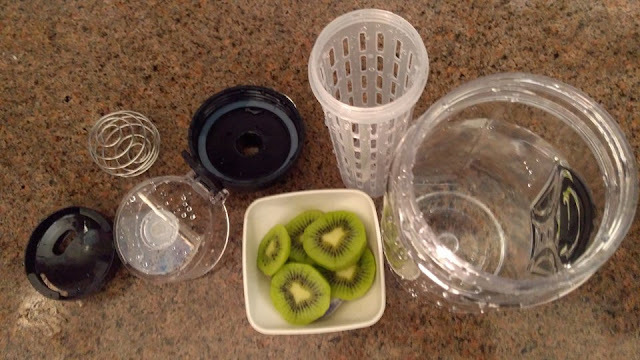 With this fruit infuser, you get a shaker ball to mix the protein powder in the fluid. It's made of 100% food grade rustfree 304 stainless steel. 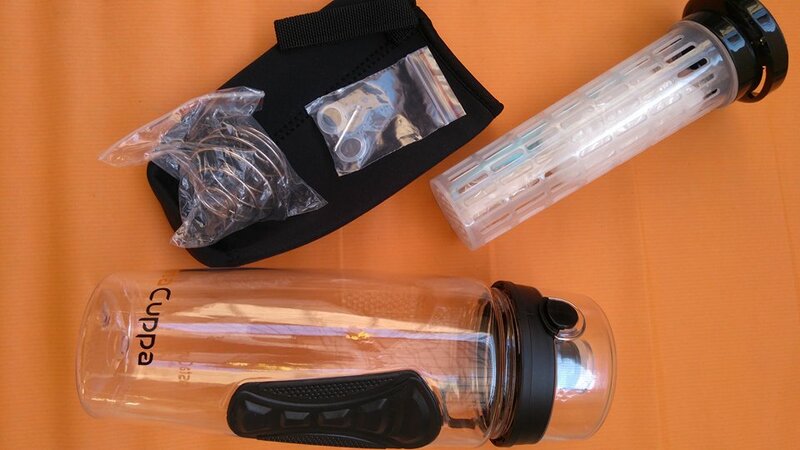 This perfectly-fitting sleeve helps to keep the water cooler for longer and reduces the bottle sweat that the most single wall bottles generally get. You may keep the bottle on a table or any flat surface without fear of toppling due to its leaving a stable base. Though the bottle is large-mouthed and can be easily washed, but I'm glad that the brand has provided with a sponge cleaning brush with the bottle to make the job easier. Cucumber, watermelon, melon, mint, kiwi, strawberries, fresh ginger root, orange, pear, apple, dried herbs and flowers are some common infusers to be added for flavours depending on your taste and purpose. 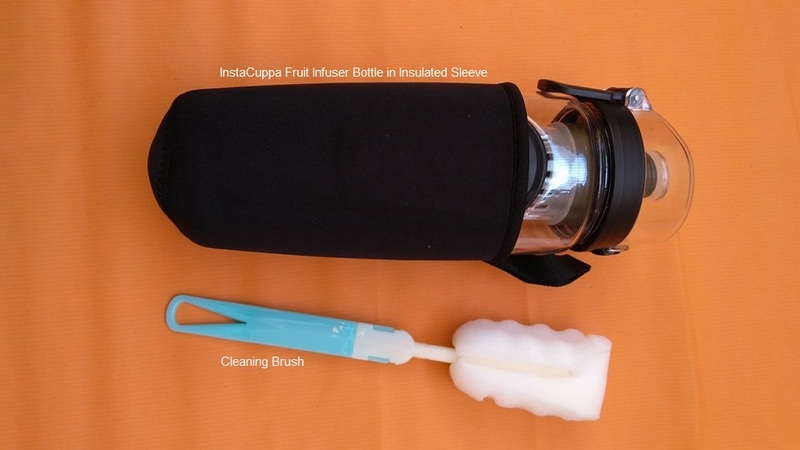 The fruit-infuser bottle easily fits my car's cupholder and when I'm carrying it around in my handbag or travel bag, it prevents any leakage due to rubber seal around the screw cap. 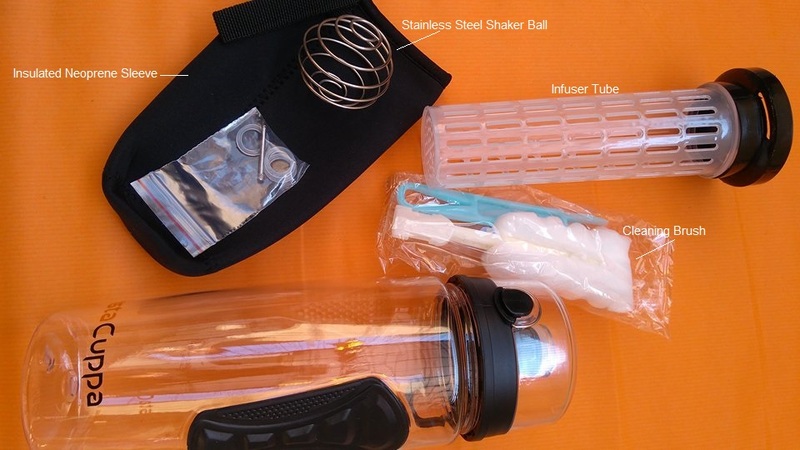 Also the top lid doesn't fall down on you while you drink water holding the bottle in an angular position, since it's secure by a safety ring and holds the lid in place. 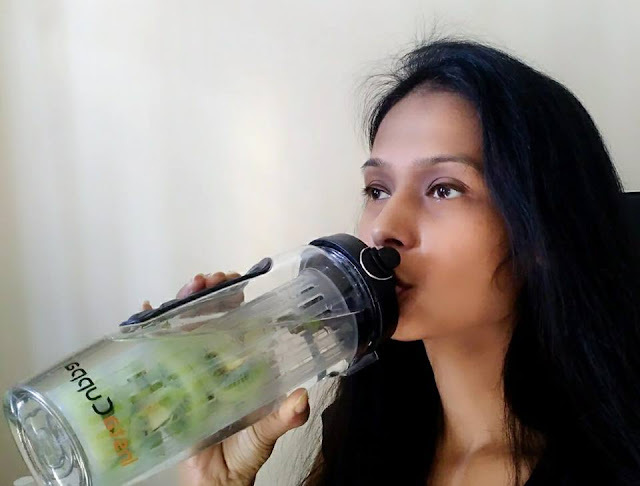 Drinking flavoured water infused with essence of fruits has considerably increased my water intake as it tastes good and fulfills the need of essential nutrients as well. I may drink as much I feel like without the worries of excess calories or sugar intake. It naturally controls my cravings too, so if you're on a diet routine, this fruit infuser is your loyal companion. Go for it! !